I've got a bit behind here. 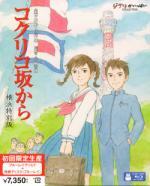 Arietty and The Whisper of the Heart both got UK Blu-ray releases on the 9th January 2012. 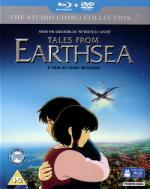 Tales from Earthsea and Howl's Moving Castle received their UK Blu-ray releases this past Monday the 25th June 2012. Copies owned and reviews to come. The latest Studio Ghibli film in Japan, From Up on Poppy Hill (Kokurikozaka kara) a Goro Miyazaki film, received its Japanese Blu-ray release on the 20th June 2012 and a copy is on its way to me. The next titles to get the Blu-ray treatment in Japan are Grave of the Fireflies and My Neighbour Totoro with their release on 18th July 2012 and I have an order placed for My Neighbour Totoro. I did toy with the idea of buying Grave of the Fireflies as well as there is a limited edition box containing both these titles but decided to save my pennies. Again these latest Japanese releases are reported to be region free and contain English subtitles. From the creators of SPIRITED AWAY and PONYO and available for the first time on Blu-ray in stunning high-definition comes the masterpiece HOWL'S MOVING CASTLE. 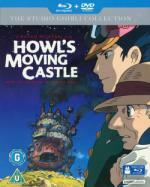 Directed by the Oscar®-winning Hayao Miyazaki, HOWL'S MOVING CASTLE is set in the magical world of wizardy and spells. Follow the adventures of Sophie and her incredible odyssey to lift a witch's curse, whilst being swept off her feet by the handsome and mysterious wizard Howl who offers Sophie refuge in his magical moving castle. Based on the popular book by British author Diana Wynne Jones. The English language version features the voices of Jean Simmons, Christian Bale, Lauren Bacall, Blythe Danner, Emily Mortimer, Josh Hutcherson and Billy Crystal. My original review of the R1 DVD is here. Even more wonderful and gorgeous now in high definition. The whole film popped for me with colour depth and brilliance and with the sound seeming to have an extra dimension even though it was only down mixed DTS from my PS3. Another worthy transfer but a little less of a pop with this but the upgrade to Blu-ray doesn't warrent a change to my rating. A gentle romance film. Set in 1963 Umi lives in Yokohama but everywhere is getting ready for the 1964 Tokyo Olympics. Part of this preparation is the replacement of old and decrepit buildings with new up-to-date facilities. One of the buildings marked for demolition is the the Student Room at Umi's high school. A group of student leaders are trying to get the building saved and Umi gets involved with the activities after Shun, one of the student leaders, gets photographed with her. They progress trying to save the building and also start a budding romance. However the romance is halted with a twist in the relationship. 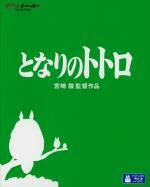 Follow the adventures of Satsuki and her four-year-old sister Mei when they move into a new home in the countryside. To their delight, they discover that their new neighbor is a mysterious forest spirit called Totoro-who can be seen only through the eyes of a child. Totoro introduces them to extraordinary characters-including a cat that doubles as a bus!-and takes them on an incredible journey. Still a truly marvellous film and this Blu-ray edition enhances it with some added depth and colourings from the added resolution. The UK Blu-ray of My Neighbour Totoro now has a release date of 12th. November 2012. I was sure that Grave of the Fireflies Blu-ray had the same date but that is no longer shown. The next Japanese Blu-rays will be Kiki's Delivery Service (Majo no Takkyubin) and Only Yesterday (Omohide Poro poro) on 5th. December 2012, again these are listed as region free with English subtitles. I started collecting those Disney releases of Ghibli in the US. But while there is currently three more available I am hesitating to get them due to the high pricing (I only see them above $20). On the other hand Disney's quality is usually rather high. How is the quality and pricing of those UK releases? The quality seems to me to be very good. The newer releases are generally available as a BD/DVD combo and upon release generally priced around £16.00. Maybe for you though one sticking point might be that the UK distributors, who were Optimum Releasing but have now become StudioCanal, have locked the Blu-rays to Region B unlike the Japanese or US releases, of course also the DVD will be Region 2 but that is less problematic. Another odditiy is that the UK releases tend not to have English HoH subtitles unlike their Disney counterparts, this means that if you watch/listen to the dubbed version then the UK subtitles are still for the Japanese language track rather than subtitles for the English language track. I remember you saying that you did watch in original language but I'd thought I'd point out that the dubtitles were not on the UK releases anyway. Another thought I had was that Only Yesterday, which is in the next set of Blu-ray releases in Japan, has yet to appear in America on DVD so I wouldn't be surprised if that doesn't get a US release in Blu. Reasons behind Disney's reticence to release Only Yesterday are in my review of the UK DVD here. So you also seem to recall that teh Disney releases have dubtitles...? Well, I always thought that not knowing the original language dubtitles are less of an issue than if I would know it. Sorry I probably didn't explain it properly. The Disney DVD releases usually had 2 English subtitle tracks. One was the subtitles for the Japanese language track and the other, usually listed as HoH subtitles, was for the English language tracks. It was this second HoH subtitles I was referring to as dubtitles. You are quite knowledgable here Thanks for explaining again! As I said, I find dubtitles less troublesome than some others, but onbviously a direct translation from the original source is preferred. It now appears that StudioCanal have pulled the release of Grave of the Fireflies Blu-ray and substututed it a Blu-ray release of Lupin III: The Castle of Cagliostro, still set for 12th. November. Lupin III: The Castle of Cagliostro is a 1979 film written and directed by Hayao Miyazaki based on a very popular TV series in Japan. 'Grave of the Fireflies' is still on www.hmv.co.uk for 12 Nov. Someone at a Dutch site suggested it could have become a HMV 'only' release for the time being. Of course the other option is that HMV is just slow to remove the pulled title. No clue what is truth. No sign in the online shops yet for the 5 Dec. releases you mentioned.